Metadata is part of an ArcGIS item. When the item is copied in ArcGIS, its metadata is also copied. When the item is imported into a geodatabase, its metadata is also imported. Metadata is stored in the same location as the item's data in a manner that is appropriate for its data type. For example, metadata is stored in the same location on disk as a shapefile's data in an accompanying XML file. For geodatabase items, metadata is stored in the geodatabase system tables. 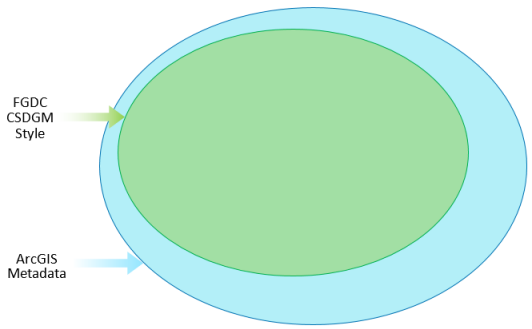 If your data is stored in an enterprise geodatabase, see the topic that describes the geodatabase system tables for your DBMS to learn more. For example, with an Oracle database you would look in the topic System tables of a geodatabase stored in Oracle to learn more. Metadata is stored in the Documentation column in the GDB_Items table. The ArcGIS metadata format contains elements that can store all content in all metadata standards that are supported by ArcGIS Desktop. It includes all Federal Geographic Data Committee (FGDC) Content Standard for Digital Geospatial Metadata (CSDGM) metadata content, all ISO 19139 metadata content, all North American Profile metadata content, and all INSPIRE metadata content. It also includes ArcGIS-internal content such as thumbnails, enclosures, and detailed properties of ArcGIS items; this information is useful and important for the ArcGIS platform, but is not included in official metadata standards and profiles. No matter which metadata standard or profile you are following, you enter content with one editor—the ArcGIS metadata editor. No matter which metadata style you use, all information that you provide on the Description tab is stored in the same manner in the item's metadata—in the ArcGIS metadata format. By default, when you view an item's metadata, ArcGIS automatically records information about its intrinsic properties in its metadata in a process known as synchronization; these properties are only stored and updated in the ArcGIS metadata format. Choosing a metadata style is like applying a filter to ArcGIS metadata. The ArcGIS metadata editor and the underlying ArcGIS metadata format remain the same, but the new filter changes your metadata experience. It can alter how much metadata content is viewed and how it is displayed, as well as which pages are included in the editor and how they work. For example, a feature class has an entire ArcGIS metadata document containing many properties and documentation describing it. However, the default Item Description metadata style filters most of it out, and provides you with only a small set of information to see and edit—the information used by the ArcGIS platform. A metadata style filters an item's ArcGIS metadata so you only work with appropriate content for that style. For metadata styles designed to support a standard or profile, the style provides access to more information. Less of the item's ArcGIS metadata document is filtered out. The style ensures you can see and edit all content appropriate to the metadata standard or profile as well as information that is important for the ArcGIS platform, such as thumbnails and field descriptions. Metadata styles associated with a standard provide access to content appropriate for that standard. While different styles might give you access to more or less metadata content, that information is always stored in the ArcGIS metadata format. If you are creating FGDC CSDGM-style metadata today, and a year from now your organization decides to create North American Profile-style metadata instead, that's OK. To make that change, you only need to change your metadata style in ArcGIS. When you change your metadata style, all of the content you entered before is still exactly the way you left it because metadata content is stored the same way for all metadata styles. You might be required to provide some different information than before to comply with the new standard's rules, and additional concepts that are only associated with the new style may become available, but the content you've already provided doesn't need to be converted to a new format. For new items created with the current version of ArcGIS, if you view and edit their metadata on the Description tab, that metadata will only contain information stored in the ArcGIS metadata format. However, some items that have existed for some time may have content created using ArcGIS Desktop 9.3.1 or an earlier release. Its metadata content is likely stored in either the FGDC CSDGM or ESRI-ISO metadata XML formats alongside other ArcGIS-internal information. The 9.3.1 FGDC metadata editor and utilities created, displayed, and managed content in the native FGDC CSDGM metadata XML format inside an item's metadata. The 9.3.1 wizard-style ISO metadata editor and utilities created, displayed, and managed content in the ESRI-ISO XML format. 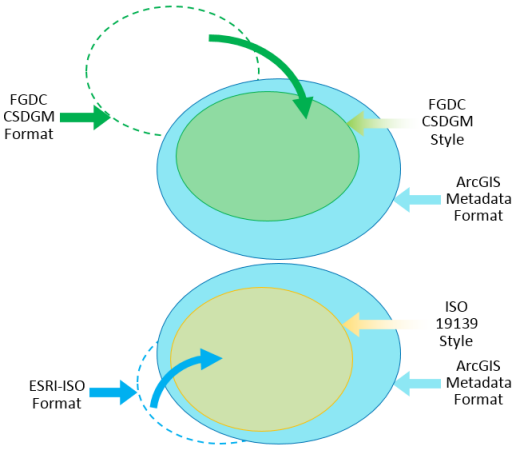 The FGDC CSDGM format XML elements and the ESRI-ISO format XML elements are mutually exclusive. 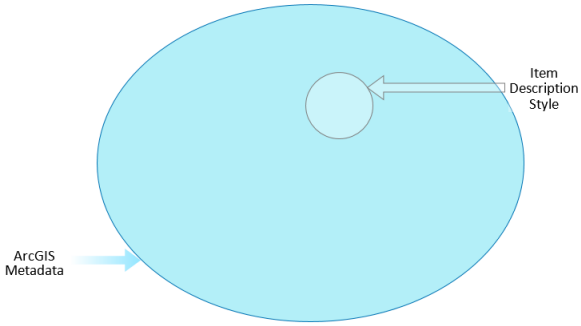 If both metadata editors were used, an item's metadata would contain two copies of the same information in parallel sets of XML elements. Supporting other standards involved adding custom editors and utilities for creating, displaying, and managing content; these would typically manage content in additional sets of parallel XML elements. The ArcGIS metadata format borrows a few XML elements from the FGDC CSDGM XML format: the elements that describe an item's attributes. It also borrows many XML elements included in the ESRI-ISO XML format; in some respects, you can think of the ArcGIS metadata format as version two of the ESRI-ISO format. However, ArcGIS metadata also includes many new XML elements, and stores some of the same concepts in a new way. When you view metadata for existing items, new synchronized ArcGIS metadata elements will automatically be added alongside any existing FGDC CSDGM-format or ESRI-ISO-format metadata content. You can also see any content stored in the FGDC CSDGM metadata format under the FGDC Metadata (read-only) heading; this heading only appears if FGDC CSDGM-format metadata exists. 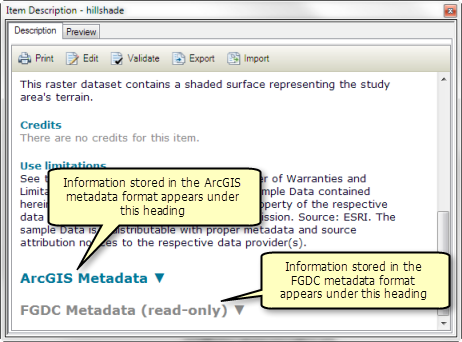 Content that is shared between the FGDC CSDGM format and the ArcGIS metadata format will appear under both headings. While you can see FGDC CSDGM-format content, this information is only available for viewing on the Description tab, which is why the information is identified as being read-only. There is no need to retype all of an item's existing metadata on the Description tab. A geoprocessing tool is available to upgrade existing FGDC CSDGM-format metadata content or ESRI-ISO-format metadata content to the ArcGIS metadata format. The Upgrade Metadata tool copies information in existing FGDC CSDGM or ESRI-ISO metadata elements that are not included in the ArcGIS metadata format to the equivalent ArcGIS metadata elements. Upgrade either existing FGDC CSDGM-format information or ESRI-ISO-format information to ArcGIS metadata to edit it in the current release. If an item has existing metadata in the ESRI-ISO format that was typed by a person—not automatically added by ArcGIS 9.3.1—it is upgraded automatically to ArcGIS metadata when you view it on the Description tab. The automatic upgrade is not permanent; it is discarded unless you edit the item's metadata and save your changes on the Description tab. Some of the item's FGDC CSDGM-format metadata content was typed in a metadata editor—not added automatically by ArcGIS Desktop 9.3.1. No content was typed in a metadata editor that stored information in the ESRI-ISO metadata format—content added automatically by ArcGIS Desktop 9.3.1 in this format is ignored. No metadata was typed in the Description tab and saved anywhere except the Item Description page. Click Yes to upgrade the existing FGDC CSDGM metadata content right away. 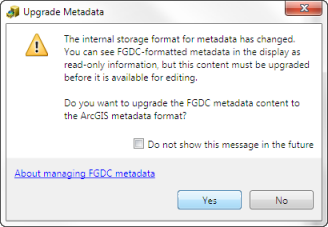 The Upgrade Metadata tool opens and the Upgrade Type parameter is automatically set to FGDC_TO_ARCGIS. If you would rather wait, click No. The Upgrade button will be available on the Description tab. You can use it later to upgrade the item's metadata. If you prefer not to be notified when existing FGDC metadata content hasn't been upgraded, check the Do not show this message in the future option. Notifications can be enabled again on the Options dialog box for your ArcGIS Desktop application. If an item's metadata includes existing content typed by a person in both the FGDC CSDGM and ESRI-ISO metadata elements, you must choose one set of information to upgrade to ArcGIS metadata. You should upgrade whichever set of metadata is more complete to ensure you don't lose important information. Usually, the FGDC CSDGM metadata content will be more complete. After upgrading, your original metadata content is available on the Description tab in the ArcGIS metadata format for editing, validating, exporting, and other operations in ArcGIS. If you have been creating metadata following the FGDC CSDGM metadata rules and guidelines, the arrangement and names of elements will be a bit different than you are accustomed to in the ArcGIS metadata editor, but all of the FGDC CSDGM metadata concepts are available on the Description tab. Upgrading doesn't alter the item's ArcGIS-internal content: the geoprocessing history, thumbnail, enclosures, and so on. Upgrading doesn't remove any existing FGDC CSDGM- and ESRI-ISO-format elements. Properties of the item that were recorded in its metadata by ArcGIS Desktop 9.3.1 aren't upgraded. The current version of ArcGIS automatically updates the item's metadata to include its current properties at the end of the upgrade process. If an item's metadata includes content in the native FGDC CSDGM metadata XML format, that content is displayed under the FGDC Metadata (read-only) heading. 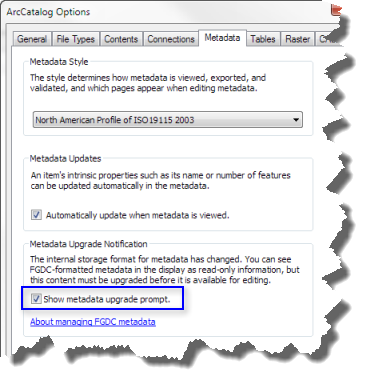 Upgrading existing FGDC CSDGM metadata content is strongly recommended to support basic operations in the current version of ArcGIS Desktop that involve metadata. If you don't upgrade, you can search for items in ArcGIS, and publish them to ArcGIS Online using ArcMap. When information isn't found in the ArcGIS metadata elements associated with the Item Description metadata style, ArcMap will look for information in the related FGDC CSDGM metadata elements and index or publish that content instead. If you don't upgrade, you can view an item's simple Item Description summary. However, the rest of the item's FGDC CSDGM metadata content remains unavailable. Most of the existing content won't appear under the ArcGIS Metadata heading. The buttons on the Description tab won't process any FGDC CSDGM-format metadata. ArcGIS won't automatically update it with the item's current properties. 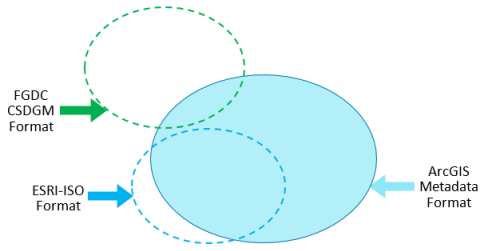 Other operations in ArcGIS may not find the information they are looking for and require you to retype the information. You will not be able to see, edit, or search an item's FGDC CSDGM-format metadata in ArcGIS Online or ArcGIS Pro. If the item's existing FGDC CSDGM metadata hasn't been upgraded, and you start editing metadata on the Description tab, the Item Description page displays the same content as the simple Item Description display and the Field page shows the existing FGDC CSDGM attribute descriptions. The other pages will be empty except for any synchronized properties that you can edit. If you edit information on the Item Description page, your edits are saved in both the FGDC CSDGM metadata elements and the corresponding ArcGIS metadata elements. If you edit information on the Fields page, your edits are saved in the FGDC CSDGM metadata elements, which are shared with ArcGIS metadata. If you add content using any other page, your changes are saved to the appropriate ArcGIS metadata elements only. Once an item's metadata includes ArcGIS metadata content that was upgraded or typed by a person, any future indexing and publishing operations only use information stored in the ArcGIS metadata format. Also, the simple Item Description display and the Item Description page in the ArcGIS metadata editor will only show and update ArcGIS metadata elements—the associated FGDC CSDGM metadata elements will no longer be updated. When FGDC CSDGM metadata is upgraded to ArcGIS metadata, a copy of the item's original metadata document is stored within the item's metadata as an enclosure for reference. You can access it using the Metadata Properties button on the ArcCatalog Metadata toolbar.